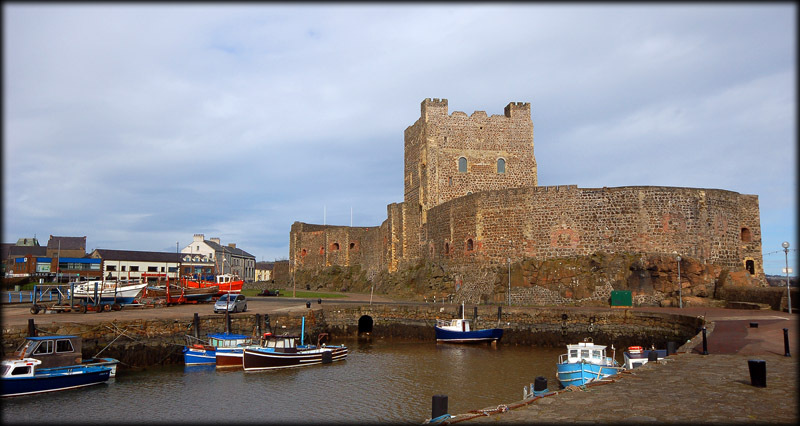 I can hardly describe the excitement I was feeling as we approached Carrickfergus Castle - a combination of awe, wonder and delight. The castle, one of the best preserved medieval structures in all Ireland, rises from a rocky outcrop and clearly fulfilled it's role as defense for Belfast Lough. 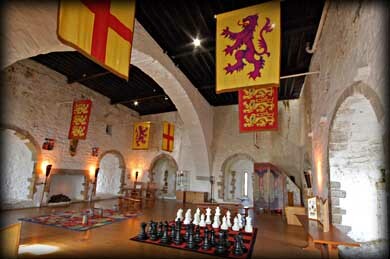 As was typical of the time, this castle was built by a Norman conqueror in 1177. 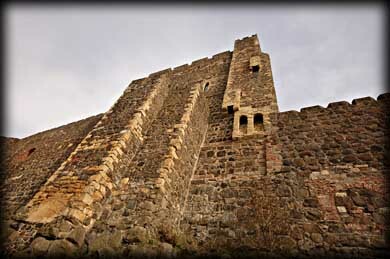 John de Courcy is credited with building the inner ward with several buildings including a massive 4-storey keep, a small bailey at the end of the promontory with a high polygonal curtain wall, and the east gate. 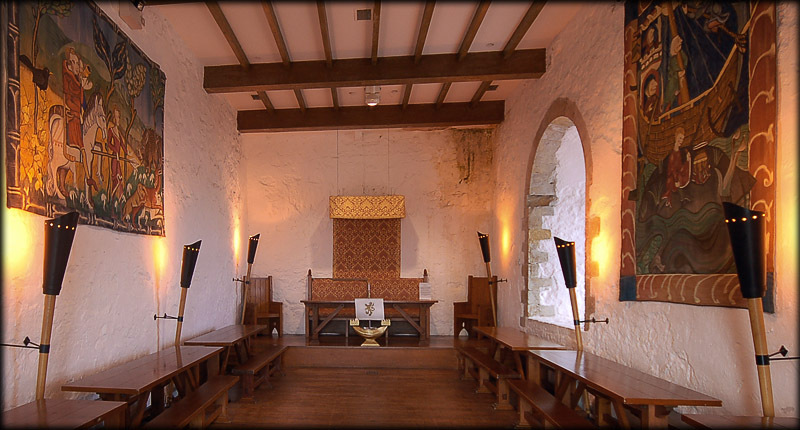 De Courcy was ousted in 1204 by another Norman adventurer, Hugh de Lacy, who is credited with building the first castle in Carlow and the Black Castlle at Leighlinbridge. De Lacy enclosed the rest of the promontory to form an outer ward, doubling the area of the castle. 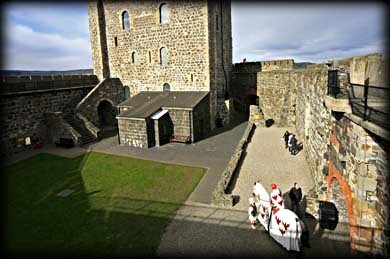 The gatehouse is flanked by two circular towers with arrowslits and is believed to have been approached by a moveable bridge over a pit. It is further defended by a machicolation outside the gateway and two massive portcullises at either end of the gatehouse with a murder hole between them. The ribbed vault over the entrance passage, the murder hole and the portcullises are later insertions started by de Lacey. 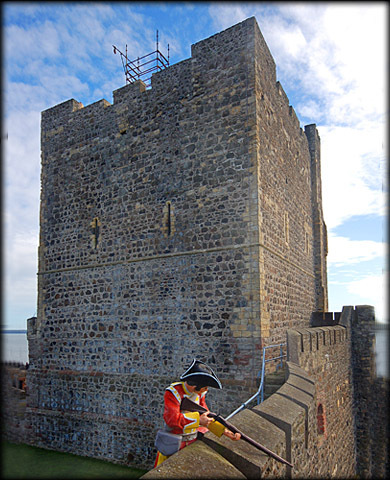 There have been many additions and subtractions over the years as the castle was attacked and captured numerous times and used for many purposes including a prison by the French (the six guns on the east batter remain of 22 that were used in 1811 as it was heavily defended during the Napoleonic Wars), and a magazine and armoury by the British. It even served as a garrison and ordnance store during the First World War and an air raid shelter during the Second World War. The castle survived over 750 years of continuous military occupation and in 1928 ownership was transferred to the state for preservation as an ancient monument . 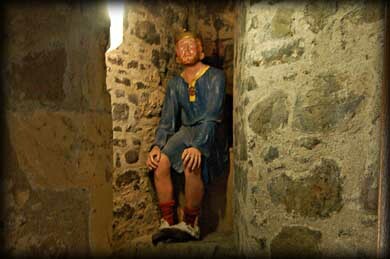 We thoroughly enjoyed exploring this castle and were delighted by the life-size models of various inhabitants and the wonderfully restored rooms in the keep. Situated: Very easy. On the east coast in Carrickfergus Town. Car-Park situated next to the castle. Discovery Map 15: J 4136 8726. Last visit March 2011.